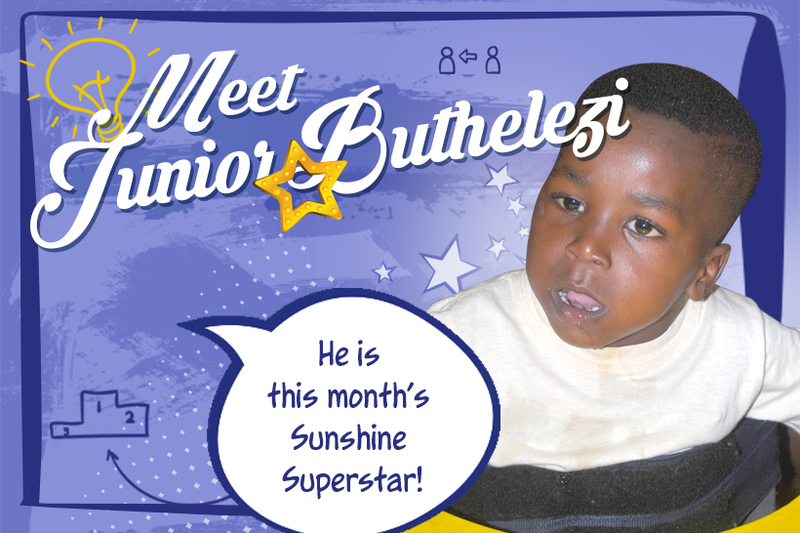 Junior Buthelezi is our Sunshine Superstar of the week. His is a tale of triumph over great odds – and we are so proud of him! Junior Buthelezi is 6 years old and has severe Cerebral Palsy. When he first came to the Sunshine Eldorado Park Early Intervention Centre in 2015, he was unable to coordinate his limbs, struggled to swallow food, and was drooling. His head was also extremely floppy, making it difficult for him to move. It was heartbreaking to see such a tiny body wracked with so many difficulties. In Junior’s case, we are delighted to report that with the steadfast commitment and encouragement of his carers, he has undergone a wonderful transformation. He has become very active and using bunny hops to get around, enthusiastically fetches his toys from the lower shelves. While he is still on soft foods, his swallowing is easier, he is drooling less, and is even attempting to chew. Junior is now able to hold his head up for longer periods and can finger feed himself. Perhaps the chips he loves so much have something to do with it! This little boy’s remarkable progress fills our hearts with delight. We look forward to more milestones for Junior – milestones that will allow him to fully enjoy the joys of childhood.